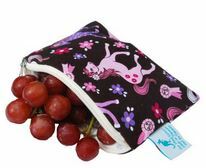 These snack bags are great for preschoolers and kindergarten kids and have an easy to open zipper. These little guys can fit a full cup of raisins or a sliced apple. Machine washable, dry on low or hand wash. Available in a variety of fun prints!